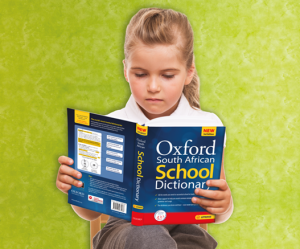 Oxford SA Blog | How often should I buy my child a dictionary? Home Dictionaries How often should I buy my child a dictionary? How often does my child need a new dictionary? Though much depends on your child and his/her language level, including whether your child is a home-language or additional-language speaker, one can usually follow the phase guidelines in our school system: Foundation, Intermediate, Senior, and FET (Further Education and Training) phases. Often two phases may overlap and you can stretch the lifespan of your child’s dictionary. Grades R-3: Introduce your child to the alphabet, develop basic reading and writing skills, and build core vocabulary. Start off with a very basic and richly illustrated first bilingual dictionary; perhaps add a phonics spelling dictionary towards the end of this phase; and make use of dictionary flash cards to build vocabulary and encourage word recognition. Grades 4-9: Your child should be ready to move on to a primary school dictionary containing the basic vocabulary and curriculum words necessary to write, read and study, though still partly illustrated to facilitate a quick grasp of difficult new words and concepts; and use dictionary card games to grow vocabulary, cement spelling and grammar rules, and build confidence in using language for various purposes. Grades 10-12: By this stage, your child will have outgrown illustrated primary dictionaries and will need a dedicated secondary school dictionary with a wider vocabulary, curriculum words and terms for various school subjects, and additional information such as indicators of part of speech, inflections, pronunciation, different senses, synonyms and antonyms, and notes on spelling, usage, and origin. Your child may be able to use this dictionary beyond the school years, or you may find that he/she benefits from an advanced learner/adult dictionary, especially for tertiary studies or work. Of course, learning a first or second additional language will require starting all over again as far as that language is concerned. Also keep in mind that your child will naturally move from bilingual to monolingual dictionaries as his/her grasp of a language grows, and eventually may need a thesaurus or a dictionary/thesaurus combination to help him/her achieve a deeper, wider understanding of the language. You may also choose to support your child in certain subjects by investing in an additional subject-specific dictionary, e.g. for Maths or Science.